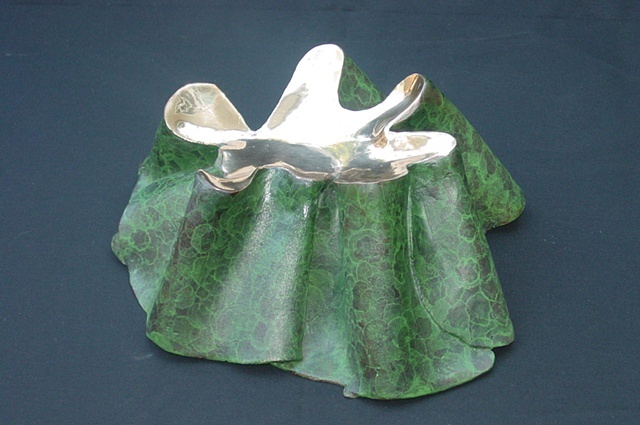 GEOFORM: Cast silicon bronze with hot patina and center polish . The original conception of this form was inspired by the PuU's in Hawaii on the Big Island. Geology is my second calling. I made several of these in clay and some were raku fired and some were stoneware fired, but bronze is a more durable technical process. It rests on Absolute Black Granite and the patina can vary. Part of this cost will benefit the future castings of particular ceramic work in bronze. With options on patina and shipping price varies .